one (1) special purchase, "non-food"-package per year. In the alternative we are requesting that the Administration establish a "grace period," and in this grace period allow us to receive one (1) special purchase "non-food"-package. 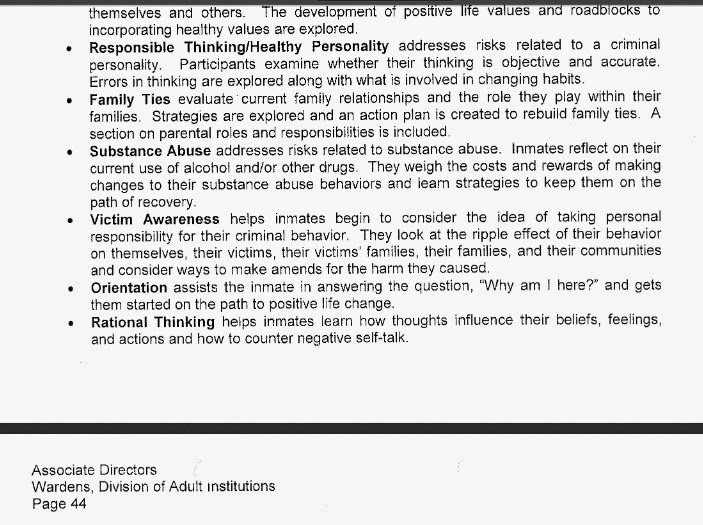 The authoritarian psychosis of reactionary men and women is infinitely capable of rationalizing its own evil and justifying it under “the rule of law.” The CDCR spokesperson, Terry Thornton, can bluntly say torture isn’t torture, and somehow convince herself of the delusion that it is the same way the Victorian-era preacher convinces himself the repressed woman is “happy,” docile and joyous in her submission, and it is the same way the union soldier convinces himself he is “doing the native savages a kindness by resettling them on a reservation to be taught the proper ways of civilization; is the same way the prison industry convinces themselves that the prisoner who “bed checked” in the same tiny cell for years, decades, deserves it because he is a validated prisoner; and it is the same as the District Court Judge today who convinces himself that the SHU prisoner has no 8th Amendment rights to be free of torture. We have established that CDCR officials are actually aware of this, which brings us to the “purpose” aspect of the torture definition. 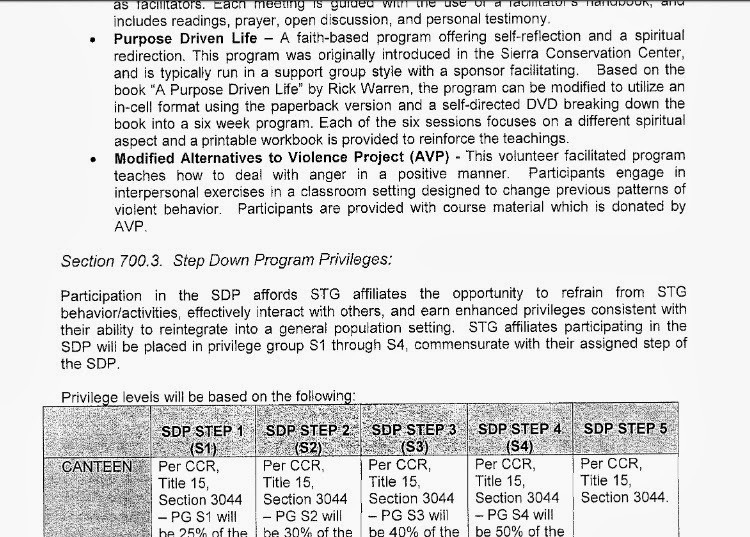 CDCR has stated on multiple occasions, the purpose of indefinite SHU confinement is to “administratively segregate gang members from the general population so the other 95% of prisoners can program without the violence of gang members.” Since the beginning of the validation - indeterminate SHU - debriefing process in the mid 1980s, violence in CDCR facilities only increased exponentially. So this is either an outright lie, or “gang members” are not the origin of prison violence. This fact was one of the many contradictions former Undersecretary Kernan was confronted with by legislators at the August 23, 2011 Public Safety Committee Hearings in Sacramento, concerning the CDCR practice of “administrative segregation” which in actuality, does not necessitate indefinite confinement in SHU torture units. 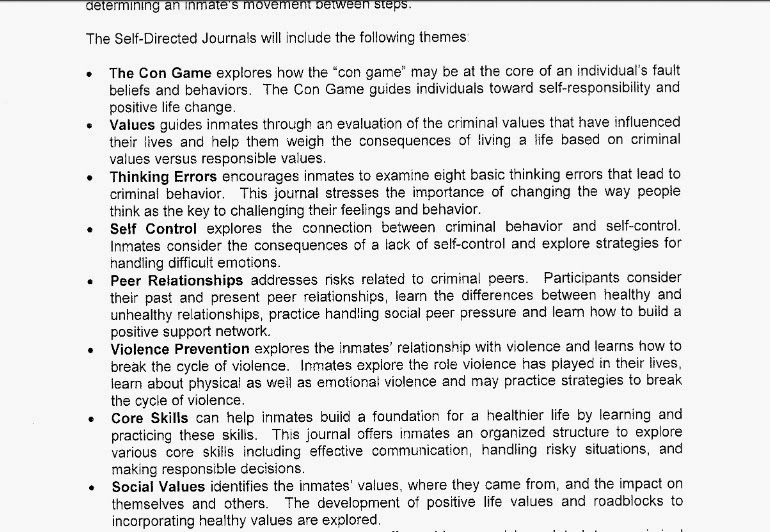 If indefinite confinement in solitary was truly not the aim of prison officials, a standard level IV 180 design prison yard setting exclusively housing “validated prisoners” could serve the same end for $24,000 less per prisoner per year. However, we can illustrate the CDCR’s methods briefly by using CDCR’s own language: Article 22 of the Department Operating Manual (D.O.M. )(50270) of their governing “gang management” system. In D.O. 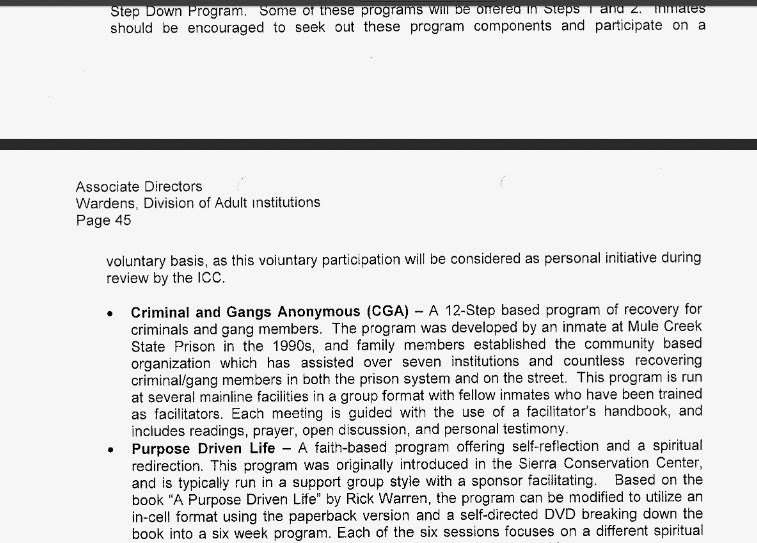 M. (52970.5), CDCR states their gang management strategy shall be to identify gang affiliated inmates and parolees; …take interdiction action, and apply sanctions.” In D.O.M. (52070.5.4) “Gang activity sanctions: “inmates… in violation of criminal and administrative statutes shall be dealt with in the strictest possible…manner. This shall include, but not be limited to loss of privileges, increase in custody, loss of work credits (read: loss of parole), enhancement of penalties; segregation from the inmate general population (read: indefinite solitary/sensory deprivation confinement). We find out answer in D.O.M. 52070.29.2 “Role and Responsibility of the Gang Intelligence Operations. 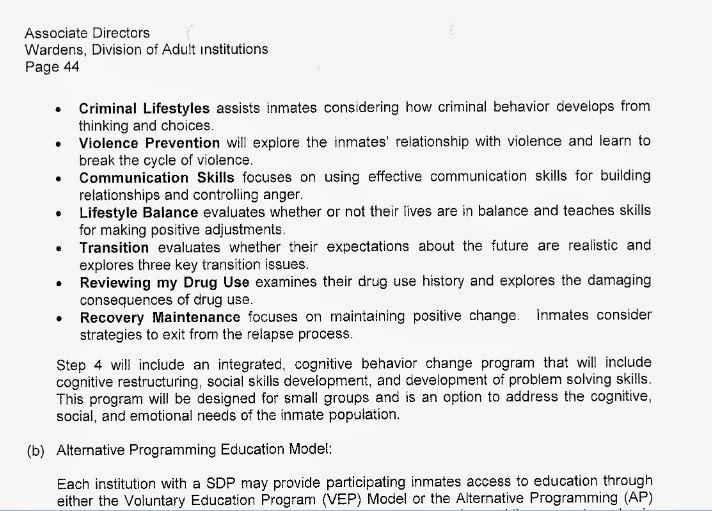 Debriefing Team,” which states, “the primary objective of the team shall be to debrief validated prison gang members housed in the SHU.” Here we see “validated prisoners in the SHU” are identified as the primary focus of debriefing efforts by CDCR. The purpose provision of the torture definition under C.A.T., article 1 states: “pain suffering… intentionally inflicted on a person for such purpose as obtaining from him or a third person information or a confession, punishing him for an act he or a third person has committed or is suspected of having committed, or intimidating or coercing him or a third person… When such pain or suffering is inflicted by or at the instigation of or with the consent or acquiescence of a public official or other person acting in an official capacity.” This is the very definition of debriefing. “To learn enough about the subject and the object’s current gang (D.O.M. 52070.19.2)..Information obtained during a debriefing shall be documented on…a debriefing report.” (D.O.M. 52070.19.8) Validation/indeterminate SHU confinement/debriefing is all about gathering information, coercing the subject to become an informant on others (a third person), and this becomes a tool of the state. This is unequivocally torture by any definition. Debra Saunders goes on to state that CDCR employees gave all hunger strikers “Gatorade and vitamins”, but no such thing occurred here at Corcoran. If a hunger striking prisoner accepted Gatorade here, it would take you off the hunger strike. Officers not only did not make daily rounds to see who needed medical attention, but custody staff went out of their way to not offer strikers any attention. It was the exclusive province of CCHCS medical staff and they were instructed by Chief Medical Officer, J. Wang, to ignore the CCHCS mass hunger strike, fasting, and re-feeding care policy (IMSP&P, vol 4,Chapt.22.2). Daily rounds, consisted of nothing more than a nurse with a clipboard coming by your door and asking, “are you still on a hunger strike?,” then walking away. That’s it. 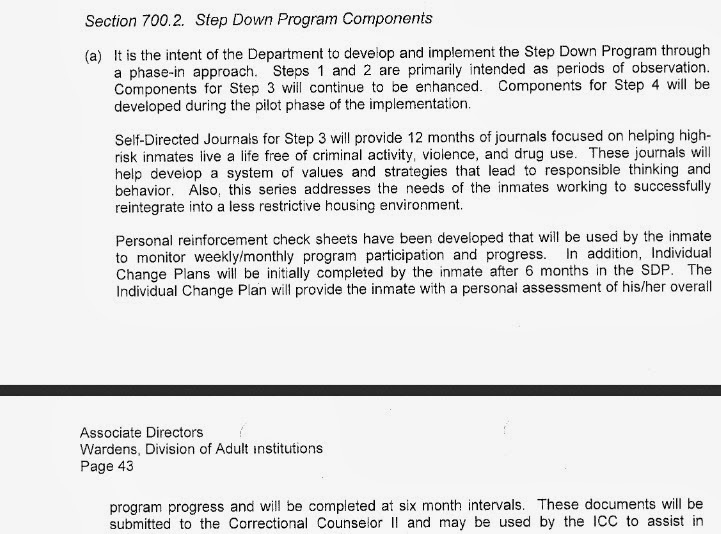 According to the information CDCR spokesperson Terry Thornton provided Debra J. Saunders (accounting for its dialectic), 50% of Tehachapi SHU prisoners are in solitary confinement; 60% of New Folsom SHU prisoners are in solitary confinement; 65% of Corcoran SHU prisoners are in solitary confinement’ and 90% of Pelican Bay SHU prisoners are in solitary confinement - and at the same time, she continues to insist, there are no prisoners in solitary confinement in California.